Solar Reserve received its last required approval for its Crossroads Solar Energy Project in Arizona last week and should soon be able to begin construction. The Maricopa County Board of Supervisors unanimously approved Solar Reserve's conditional use permit for a combined 150-megawatt concentrated solar power and 65-megawatt solar photovoltaic installation that will be able to provide enough energy day and night to power 100,000 homes. Officials celebrated the start of construction Tuesday on a $500 million solar-power plant about 40 miles west of Phoenix. Some of the 800,000 solar panels for the Mesquite Solar 1 project will be made at the Suntech Power Holdings Co. factory that opened in Goodyear last year. It can produce about 15,000 panels a month. San Diego-based Sempra Generation will build the Mesquite plant near its existing natural-gas plant, using $359 million in federal loans. It was just a few weeks ago that the BLM finalized the PEIS creating solar energy zones throughout seven southwestern states, and already the BLM is expanding the solar energy zones. Earlier this week BLM proposed creating an additional Solar Energy Zone in Arizona, which would open up more federal lands to solar development. The solar energy zones were developed as part of the Obama Administration's goal of developing more renewable energy throughout the U.S. and were created under the BLM's programmatic environmental impact statement (PEIS). Basically the BLM did most of the preliminary work to determine that the 17 designated areas were ideally suited for solar. 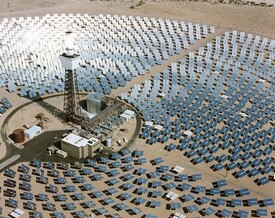 It will drastically speed up the process of planning and developing solar on the lands. The Yavapai County Planning and Zoning Commission granted the Yavapai Ranch several time extensions Wednesday to build the largest wind farm in Arizona. Two days earlier, the Board of Supervisors approved Yavapai Ranch owner Fred Ruskin's request for a zoning change for 12,500 homes and 96 acres of commercial development along Williamson Valley Road about 35 miles north of Prescott. Ruskin told the planning commission Wednesday that the wind farm and a possible astronomical observatory are the "highest priority" for him and his family over the housing development. Mesa students will see new computers, Dobson High School will get new classrooms, and the district's transportation centers will be rebuilt after voters approved a $230 million bond program Nov. 6. By a 3-to-1 margin, voters gave the Mesa Unified School District permission to sell the bonds, which could impact property tax rates. The district's assistant superintendent for business and support services, Bobette Sylvester, said the first sale - for about $46 million - will likely happen about April. The federal government won't make a decision on the Rosemont Mine as expected next month and it's not clear when it will, the Coronado National Forest's chief said Friday in announcing the latest of many delays for the $1.23 billion project. Coronado Forest Supervisor Jim Upchurch also said he doesn't know when he will decide whether to prepare a new or supplemental draft environmental impact statement on the proposed mine. That move is favored by mine opponents and the Environmental Protection Agency but opposed by Rosemont Copper and its supporters. The construction industry shed 2.2 million workers between January 2007 and last year. So now there's an overabundance of them eager for jobs, right? Contractors are struggling with shortages of workers as the home-building market comes to life and some commercial sectors strengthen. The crunch is affecting a handful of states, including Texas, Arizona, Iowa and Florida. But it's expected to worsen and spread across the USA over the next few years, building officials say. The shortages are already prompting builders to raid each other's job sites for workers.